Too little too late for the Windows tablet? 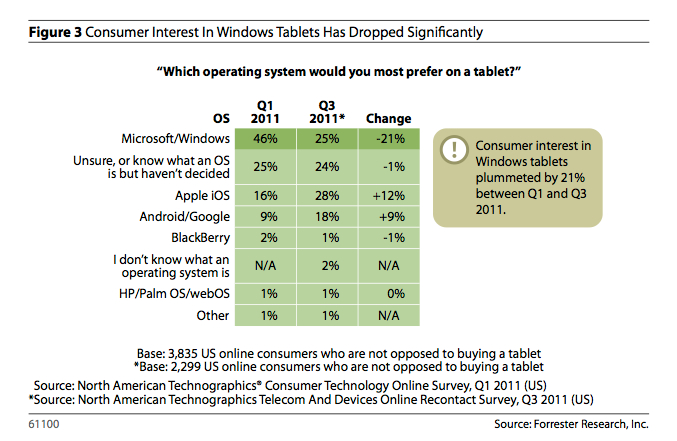 For tablets, though, Windows really isn’t a fast follower. Rather it’s (at best) a fifth-mover after iPad, Android tablets like the Samsung Galaxy Tab, HP’s now-defunct webOS tablet, and the BlackBerry PlayBook tablet. While Windows’ product strategists can learn from these products, other players have come a long way in executing and refining their products — Apple, Samsung, and others have already launched second-generation products and will likely be into their third generation by the time Windows 8 launches. Meanwhile, newer competitors like Amazon (Kindle Fire) and Barnes & Noble (Nook Tablet) are reshaping consumer expectations in the market, driving down price points (and concomitant price expectations), and redefining what a tablet is. Interestingly, Microsoft has a web tool that, when accessed on one’s iOS or Android device, lets one run an emulation of Windows Phone 7. In what some might dub a sign of desperation, Microsoft is reportedly readying a version of the Office suite for iPad – an ironic move, really, as they didn’t even announce Office apps tailored for Windows 8 tablets. Microsoft has missed the peak of consumer desire for a product they haven’t yet released. Put simply, Microsoft has missed the boat. One year is a long time in a fast-paced mobile market. Microsoft on its part has maintained that they’re just getting started, arguing that carriers, vendors and users all need a stable third platform. This is true, but market forces can be unforgiving. The iOS/Android duopoly is a reality. Barrier to entry is set too high. Battle for supremacy in tablet computing is waged on an ecosystem front. In a sense, hardware, software and even content have become secondary, it’s about how all those disparate assets are intertwined. Microsoft has a strong ecosystem in gaming (Xbox Live/Xbox 360), but Apple has the most apps and their cloud strategy and Siri should keep folks interested in the platform. Apple’s high satisfaction ration scores don’t hurt either. While Windows 8 and first tablets powered by it are yet to arrive, Apple’s been making eyebrow-raising strides in enterprise as CIOs are increasingly adopting iOS devices. That is something Microsoft should definitely be worried about. Unless you’ve been sleeping under a rock, there’s no denying Apple and Google are absolutely destroying competition in mobile. Just ask Research In Motion, once a leading phone vendor whose shares recently dropped below book value. RIM won’t release tablets running sleek QNX software for another six to twelve months. Best Buy pulled RIM’s ill-fated PlayBook thing in the all-important holiday shopping season and RIM itself is pitching the device to own employees for just $99, a 50 percent saving over the already discounted $199/$299 price point (that sparked a sales frenzy). The troubled BlackBerry maker is headed by clueless co-CEOs who think that releasing Mobile Fusion, a corporate tool for iPhone and Android devices, may appease customers. Let’s not forget about Nokia, another phone giant facing a huge crisis. It remains to be seen whether Nokia can recover, but one its days of glory are likely gone. Of course, with Microsoft and Nokia helping each other in mobile, a Nokia Windows tablet could be on the horizon at some point. On a final note, Forrester recently recommended Macs as a business tool. Just a year ago, they proclaimed iOS devices enterprise-ready. Speaking of the post-PC era, Forrester was right saying in May that post-PC devices would “revolutionize computing product strategy”.